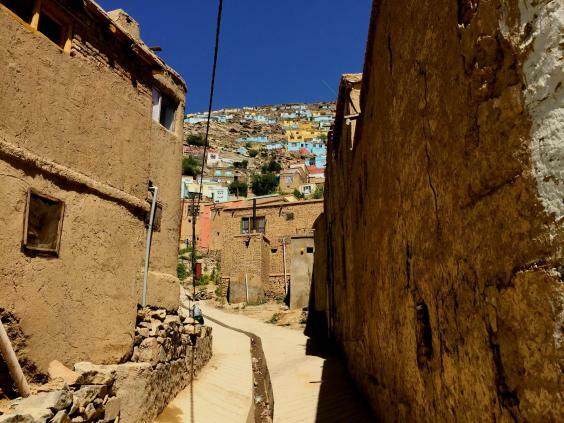 Afghans know the impact colour can have on life,” says Abdul Waheed, a 21-year-old clerk at the Afghan Parliament and resident of one of the thousands of mud-brown houses that blanket the mountains surrounding Kabul. Or, rather, the houses that were mud-brown – Waheed’s home, and the others behind him, are now painted in joyful pinks, blues and whites, as part of a new initiative to brighten Afghanistan’s capital. It isn’t easy to climb up to the houses located on the mountain tops. There’s no road; there’s barely even a path, and every step is a gamble. Open sewage flows down the rocky slopes; you have to find firm ground with every step upwards. Yet small children and older men and women who have been living in these hills for ages navigate easily as they carry water back to their houses for daily use. Despite extreme adversity, the Afghan affinity for colour has always been visible in the form of small decorations, colourful doors and hand-painted flower pots outside nearly every mud house. 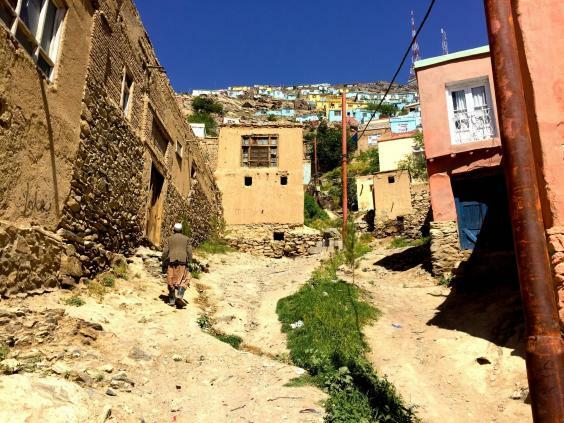 Now, the Kabul city administration has taken this aesthetic and run with it, launching a project to paint the exteriors of nearly 2000 houses on the western-facing hills of Kabul. After the fall of the Taliban in 2001, Kabul grew fast. Migrant workers and their families moved to the capital to make a decent living, the post-conflict economy mushrooming and bolstered by foreign aid. Refugees returned after years of war, and new homes were erected across the city. Those with fewer resources built their homes on the slopes of the mountains that fence the city, often without necessary city permits. Occupied by the poorest of the poor, a more resilient form of shanty town, they’re a stark contrast with the fifth fastest-growing city in the world. Though it’s being executed by the Kabul Municipal Authority, the plan is the brainchild of the Capital Regional Independent Development Authority, set up by President Ashraf Ghani himself. As well as the painted houses, it will see infrastructure improvements including electricity, water resources and paved streets. But the project, which launched last month, goes beyond providing basic services, as the colour-popping houses make clear. So far, several hundred homes in the neighbourhood of Asmayee Road are sporting bright paint jobs, transforming the previously brown landscape. The blue and pink shades were chosen by the residents themselves – other colours (including yellow, orange and red) were on offer, but residents refused shades that reminded them of bloodshed. The palette was put together by the city authorities not just to represent peace, but also to improve mental health. Dr Rohullah Amin, a Kabul-based psychologist, thinks the project has a lot of potential. “For years, Kabul had sunk under depression and tragedy, and as a result, the colours associated with the people also represented tragedy,” he tells The Independent. It’s down to the city’s recent turbulent history, he says, that even the locals’ clothing has developed into “an unspoken diktat of grey for men and black for women. “This has created an environment of colours that praise tragedy, affecting how people perceive their surroundings and thereby affecting their attitude towards each other,” he says. “But with the use of bright colours, we can manipulate their perceptions and improve how they treat each other, too. Of course there will still be bloodshed and poverty, but being in a pleasing, calming environment will change the way they respond to the situation. In a place like Kabul, where there is so much insecurity, how the citizens perceive their surroundings really matters”. Similar projects have been implemented around the world with notable success in changing not only the exteriors of the city but also the vibe. There was a significant uptick in mental health amongst the young of Santa Marta, one of Rio de Janeiro’s favelas, when a similar campaign was launched. Another village — Kampung Pelangi in Indonesia — has become an Instagram sensation with its transformation into a ‘Rainbow Village’. And Port-au-Prince painted houses in Jalousie, a shanty town, to improve morale and spruce up the neighbourhood in the wake of the 2010 earthquake. Not that Kabul is playing copy-cat – neither Sultani or Waheed had heard of the projects in Brazil or Indonesia, they told The Independent. And they don’t want to transform Kabul into an Instagram draw, they say; this project is purely for the mental health of the residents. “Bright colours play a very important role in the art, culture and architecture of Afghanistan,” says Sultani. Dr Amin agrees. People’s psychological state influences their choice of colours, he says – and “the fact that people are choosing pink and white, colours strongly associated with the feminine, really makes me happy.“ Today, despite its recent tragedies, Kabul is looking a little brighter.